Complete your lower with style and enhanced ergonomics! 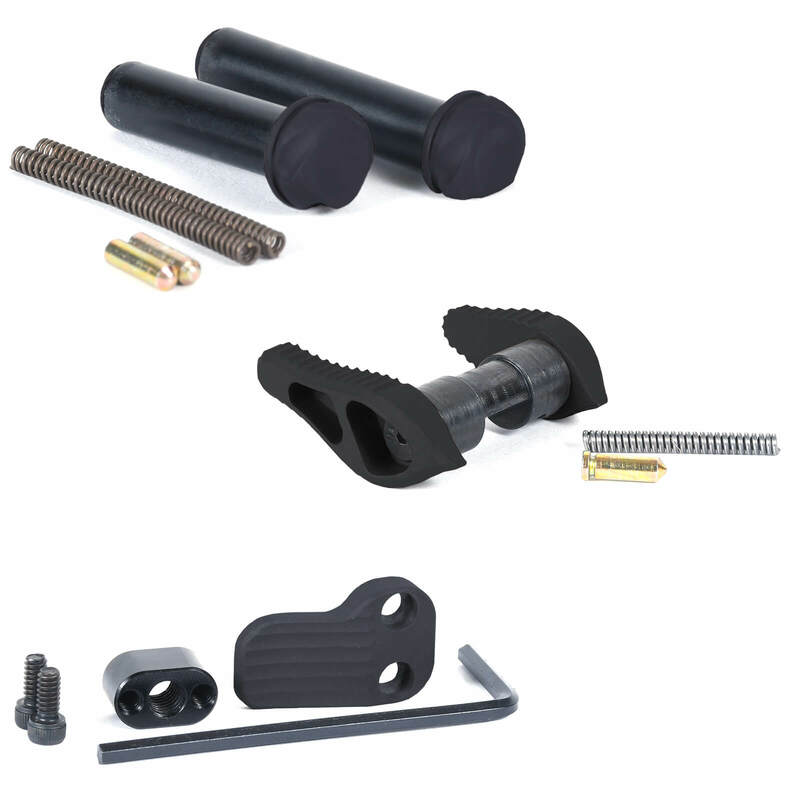 Save money by bundling a unique Timber Creek Outdoors Ambidextrous Safety, Extended Magazine Release, and Takedown/Pivot pins, all matched to Magpul’s most popular color selections in Cerakote, or the classic black anodization the AR15 is known for. The Timber Creek Outdoors Ambidextrous Safety Selector replaces your existing selector all allows for enhanced safety control for both right- and left-handed shooters. It is also capable of traditional 90 degree throw, or 45 degree short throw for individual preference. Made of aircraft grade aluminum, this selector features a sweeping design and textured sides for secure grip in all conditions. The selector features a standard-length lever on the left side of the rifle, and a short lever on the right side rifle for ideal ergonomics. Easily installs in minutes. Includes selector levers, selector bolt, 2 set screws, safety spring, and safety detent. Timber Creek’s Extended Magazine Release allows for fast and easy magazine changes for all shooters and varieties of AR15. Machined from billet aluminum with ergonomic texturing for positive control, it’s a great option to improve the look and performance of your AR. These CNC machined pins are an upgrade for your standard Mil-Spec lower, allowing easier disassembly with extended, textured caps. Comes with 2 replacement springs and 2 detents. For what I wanted you can’t beat it great design and it fits the color scheme that I wanted. Thanks for sharing your feedback, Aaron. We're glad you're satisfied with your purchase. Cheers! Great product ! FDE matches magpul great! Fast shipping ! All in all great experience! Thank you ! The kit was easy to install and looks great. I also want to thank the staff at AT3 for help with return of incorrect parts that I ordered and returned. I have already ordered the correct parts from AT3. The first place I always look to is AT3. Thanks for sharing your feedback, Marc. We're glad you're satisfied with your purchase. Cheers! Grey stuff is hard to find and this kit does the trick excellently. The extended mag release is wonderful and the ambidextrous safety feels great. All were super easy to install.